Owner / Operator: Emma has been farming since 2009 on various farms throughout the country. In 2012, Emma moved to Pennsylvania where she apprenticed at The Seed Farm. She graduated from their Beginning Farmer Training Program in 2013, before establishing Kneehigh Farm on-site. Emma first approached agriculture through Permaculture: heavy on observation and nature connection, and light on commercial production. Her philosophy now combines ecology with a commitment to making a viable and satisfying living through farming. The ethics of Permaculture—Earth Care, People Care, Fair Share—still resonate through Kneehigh Farm. In 2015, Kneehigh moved to seven acres at Lundale Farm Inc., a non-profit that rents land and housing to sustainable farm operations. The site is an opportunity for Kneehigh Farm to create a viable farm business from bare ground, and regenerate a farmscape that has been mismanaged for years. Emma's goals are to leave this land more fertile than it was found, to install infrastructure necessary for a similarly-sized vegetable farm, and leave future growers with a fully functional vegetable operation. Emma is excited to have folks visit the farm, dirty their hands, and connect with where their food is grown. 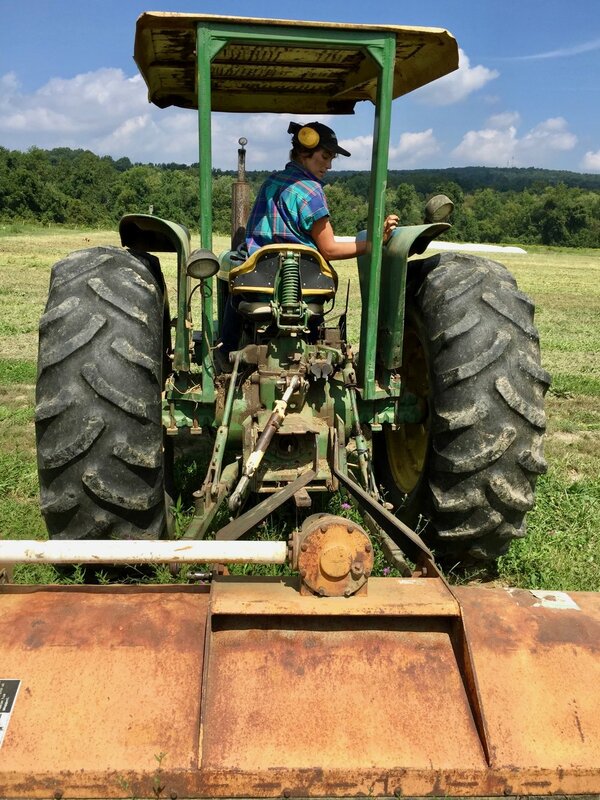 In her years apprenticing, these sensations and realizations pushed Emma to pursue farming as a full-time career. Hey everyone! My name is Miranda and I’m excited for the opportunity to work at Kneehigh Farm and get to know the community who supports it. I got my first taste of farming when I went WWOOFing last spring in Northern California, and I was inspired to do it because of my appreciation for the environment and my desire to understand a different lifestyle than what I was used to. I lived on a family-owned and operated organic produce farm, and I really got to experience what a healthy, holistic relationship between people and the land looked like. I am an avid consumer of Lacinato kale and my favorite way to eat and prepare it is in a stir-fry. Hi I’m Daisy! I started my journey in agriculture at my university in 2014 and I haven’t looked back since. I knew once being outside and making a difference in my community that this was my calling. I believe that it’s important that everyone has access to healthy and nutritious produce but most importantly supporting local businesses and farmers. I’m excited to be part of the Kneehigh Farm crew this year to see how we can reconnect as a community, and with our food as well. My favorite vegetable currently is Brussels sprouts.